By D Magazine | 10 years ago Five Mexican restaurants. Four women. One limousine. Our mission: Find the best house margarita on the rocks—all for you, dear readers. By Sarah Eveans | 10 years ago The Crow Collection of Asian Art opens a fabulous gift shop full of beautiful finds unique to Dallas. By Krista Nightengale | 10 years ago Designer Wendy Konradi combines form and function in her sophisticated—yet child-friendly—Lakewood bungalow. By Peggy Levinson | 10 years ago Where can you buy some of Wright’s essentials? At his Cedar Springs shop, of course. By Peggy Levinson | 10 years ago Natalie and Mike McGuire swapped houses with baseball star Alex Rodriguez. They couldn’t be happier with their end of the bargain. 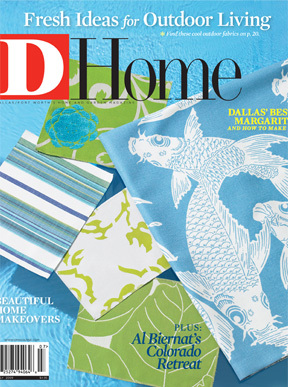 By D Magazine | 10 years ago Dallas homeowners share their renovation tales—the good, the bad, and the beautiful. By Laura Kostelny | 10 years ago Dallas restaurateur Al Biernat and his wife Jeannie take time to live the high life—at 10,600 feet, mind you—at their Colorado vacation home. By D Magazine | 10 years ago These outdoor fabrics combine the sensible with the sensational. By D Magazine | 10 years ago Sit pretty in the best seat out of the house. By D Magazine | 10 years ago Add this geometric squad your brilliant backyard. By Christine Allison | 10 years ago A look inside Aunt Blanche’s perfect world.